Samsung’s new business-friendly tablet with detachable keyboard gives Microsoft's Surface Pro 4 a run for its money. Picking up where last year’s Galaxy TabPro S left off, the Samsung Galaxy Book 12 tablet takes the lead in performance and mobile amenities while keeping its thickness and weight down. I lived and worked with the Galaxy Book 2-in-1 device for several days, and it’s now my top choice for executives and other mobile workers who need to travel light. At 11.5 x 7.9 x 0.3 in. and 1.6 lb., the Galaxy Book is slightly bigger and heavier than the TabPro S it replaces. Still, it’s thinner and about 3 oz. lighter than Microsoft’s Surface Pro 4. With its detachable keyboard case and tiny AC adapter (which, fortunately, does not require a three-prong outlet), the Galaxy Book hits the road at 2.7 lb., compared to the Surface Pro 4’s travel weight of 2.9 lb. With its rounded corners, black screen bezel and dull silver edging, the Galaxy Book looks a lot like the TabPro S. The Galaxy Book’s 12-in. AMOLED screen shows 2160 x 1440-pixel resolution. Its colors are richer and more striking than the traditional LCD screen used on the Surface Pro 4 and most other tablets. On the other hand, the Surface Pro 4’s 12.3-in. screen is slightly larger, more detailed at 2736 x 1824 resolution and marginally brighter at 315 candelas per square meter versus the Galaxy Book’s 310 cd/m2. The Galaxy Book’s touchscreen responds to up to 10 independent touch inputs; in my tests it worked for everything from sketching a graph to taking notes. The system comes with Samsung’s pressure-sensitive S Pen stylus, which has a button for doing things like erasing lines and includes Samsung’s Notes app for scribbling your innermost thoughts. Happily, the S Pen doesn’t require a hard-to-find AAAA battery, as is the case with Microsoft’s Surface Pen; on the downside, you can’t open an app by clicking the S Pen’s top. Like the Surface Pro 4, the Galaxy Book includes a slip-on fabric loop to hold its pen, but it’s still far too easy to lose the pen. Under its skin, the $1,430 Galaxy Book I looked at is built around a dual-core Core i5 7200U processor that runs between 2.5 and 3.1 GHz, depending on its load, which is a step up from the TabPro S’s M3 processor or the basic Surface Pro 4’s Core i5 6300U. It includes 8GB of RAM and 256GB of storage. Although the Galaxy Book has a Trusted Platform Module (TPM) for secure remote communications, Samsung doesn’t offer a processor with Intel’s management-friendly vPro extensions. The Surface Pro 4 has both. By folding the Galaxy Book’s origami case in different ways, you can set the tablet to four screen angles. Personally, I prefer the Surface Pro 4’s pull-out kickstand, which sets the screen at a variety of angles and lets the naked slate stand on its own. You can use the Galaxy Book's keyboard case to set the tablet to one of four different screen angles. The Galaxy Book’s case leaves the tablet’s pair of side-firing speakers open for all to hear, but -- unlike the similar case for the Galaxy TabPro S -- it doesn’t have cutout for its rear-facing 13-megapixel camera; you need to fold the flap down to shoot a picture or video. There’s also a 5mp webcam and two microphones. Night owls take notice: the keyboard has backlit 19mm keys with three levels of brightness. They have a generous 2mm of depth; the Surface Pro 4’s keyboard feels like a toy in comparison. 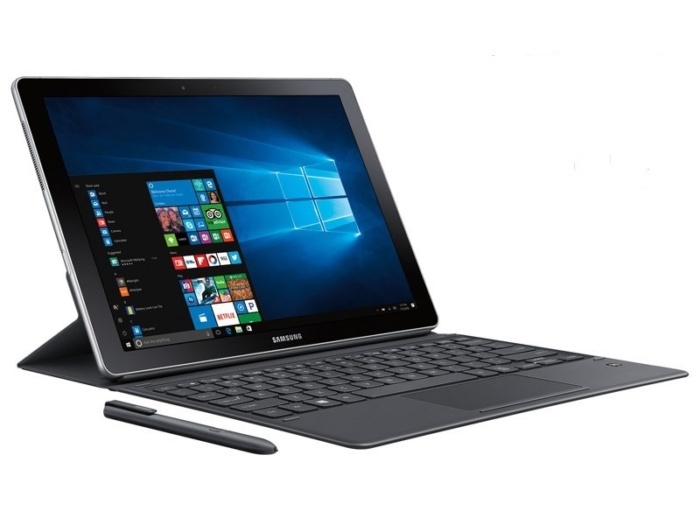 In addition to 802.11ac and Bluetooth radios, the Galaxy Book has an audio jack, a micro-SD card slot for adding storage, and two USB-C ports, which let you power the system and connect a peripheral device. (Note that you’ll need an adapter to use a projector or wired network.) The Galaxy Book not only worked on my office’s network, but I had no trouble using a Minix Neo C hub, Vivitek Qumi Q6 projector, SanDisk Ultra Fit flash drive and Braven 850 wireless speaker with it. Unlike the Surface Pro 4, the Galaxy Book’s keyboard has a Near Field Communications (NFC) connection spot. After setting it up, I briefly tapped my Galaxy S8 phone on the spot to make contact and then used the included Samsung Flow phone software to lock and unlock the tablet using the phone’s fingerprint scanner from across the room. I also connected the phone’s hotspot with the Galaxy Book for a mobile web connection. On the downside, it works only with Samsung Galaxy phones, such as the Note 5, S6, S7 and S8. All this adds up to a mobile powerhouse flagship for Samsung that scored 2,932 on the PCMark 8 series of tasks for office work, 12% higher than the 2,569 scored by the similarly equipped Surface Pro 4. Over several days of use, including a slew of meetings and a road trip, the Galaxy Book never let me down and only got warm to the touch. The system’s 5,070 milli-amp hour battery ran for 4 hours and 11 minutes on PCMark 8’s battery rundown test of nonstop work -- nearly half an hour longer than the Surface Pro 4’s 3:43. The system ran for 10 hours and 8 minutes while continuously playing 4K videos. The Galaxy Book’s $1,430 price tag is high, but with Windows 10 Pro, keyboard case, stylus and one-year warranty, it comes complete. A similarly configured Surface Pro 4 costs $1,200, but its Type Cover keyboard costs an extra $130, bringing it to $100 less than the Galaxy Book 12. To my mind, the Galaxy Book is worth every penny with its superior performance, pair of USB-C ports, vivid screen and excellent backlit keyboard case. All this makes it the current corporate Windows 10 tablet to beat.